The change puts “the simplest step first” for traditional CPR, said Dr. Michael Sayre, co-author of the guidelines issued by theAmerican Heart Association. Sudden cardiac arrest — when the heart suddenly stops beating — can occur after a heart attack or as a result of electrocution or near-drowning. The person collapses, stops breathing normally and is unresponsive. Survival rates from cardiac arrest outside the hospital vary across the country — from 3 percent to 15 percent, according to Sayre. Under the revised guidelines, rescuers using traditional CPR, or cardiopulmonary resuscitation, should start chest compressions immediately — 30 chest presses, then two breaths. The change applies to adults and children, but not newborns. 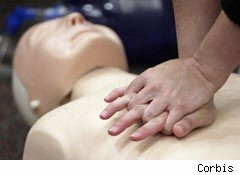 One CPR researcher, though, expressed disappointment with the new guidelines. Dr. Gordon Ewy of the University of Arizona Sarver Heart Center thinks everyone should be doing hands-only CPR for sudden cardiac arrest, and skipping mouth-to-mouth. He said the guidelines could note the cases where breaths should still be given, like near-drownings and drug overdoses, when breathing problems likely led to the cardiac arrest. Ewy is one of the authors of a recently published U.S. study that showed more people survived cardiac arrest when a bystander gave them hands-only CPR, compared to CPR with breaths. Dr. Ahamed Idris, of the University of Texas Southwestern in Dallas, said people are sometimes afraid that they’ll hurt the patient. Others have a hard time judging how hard they are pressing, he said. “We want to make sure people understand they’re not going to hurt the person they’re doing CPR on by pressing as hard as they can,” he said. Idris, who directs the Dallas-Fort Worth Center for Resuscitation Research, said that for the last two years, they’ve been advising local paramedics to start with chest compressions and keep them up with minimal interruptions. That, along with intensive training, has helped improve survival rates, he said. He said they found paramedics hadn’t been starting compressions until the patient was in the ambulance and lost time getting airway equipment together. “The best chance was to start chest compressions in the house, immediately,” he said. Copyright 2010 The Associated Press. The information contained in the AP news report may not be published, broadcast, rewritten or otherwise distributed without the prior written authority of The Associated Press. All active hyperlinks have been inserted by AOL.